If you have never heard of a ‘Chicken-fried Steak’ before, you may quite likely be as mystified as I was when I came across it for the first time. For the uninitiated, this particular culinary delicacy, originating in the American South, consists of a steak that is battered, or breaded, and then deep-fried (or pan-fried in lots of fat) much the same way as is Southern-fried Chicken. While I was thinking about trying this dish, I had a hard time deciding on battered or breaded, and I decided to go with a process that lies somewhere between the two. 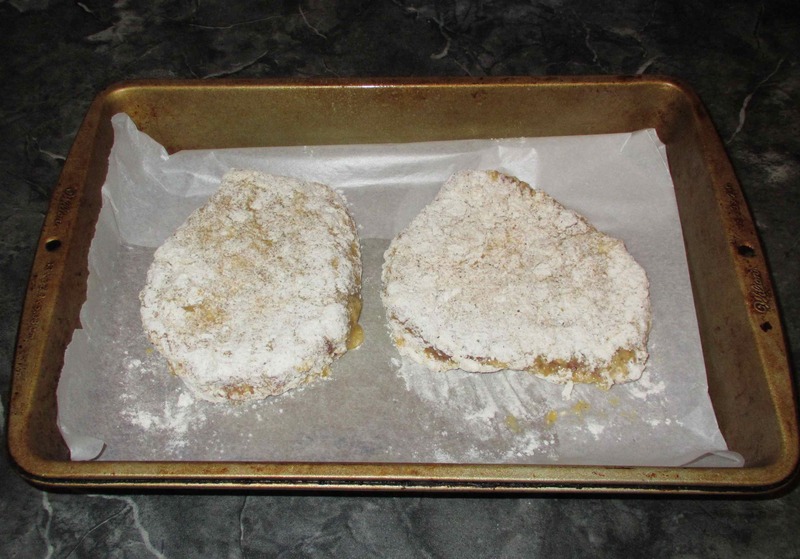 My idea was to use an egg wash, as one would for breading, but give the steaks a double dredging nicely seasoned flour to yield an extra thick coating somewhat like a batter. 2 eggs, beaten (you may need a third depending on the steak and egg size). This is not a dish where you will want to use a very expensive cut of steak and, thus, a bit of tenderizing will be in order. If you like, you can do as I have done and first cut a series of cross-hatched incisions about a quarter way through the thickness of the steak on each side. 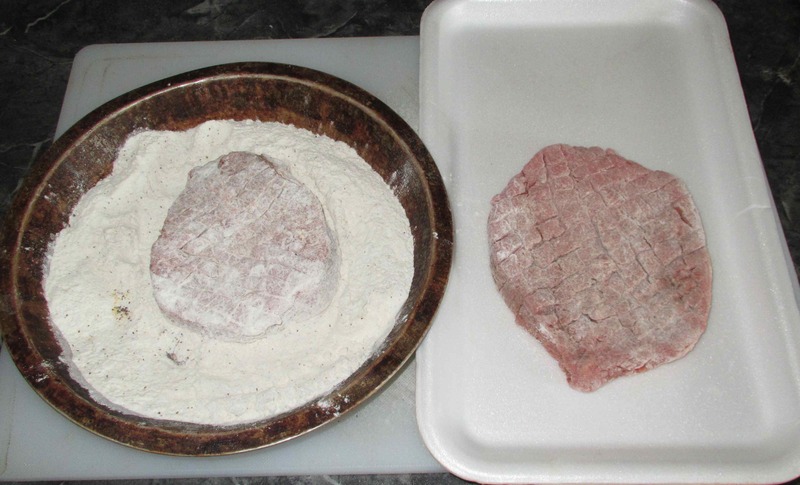 To begin, mix together the flour and the seasonings in a deep dish and then coat the meat on both sides. 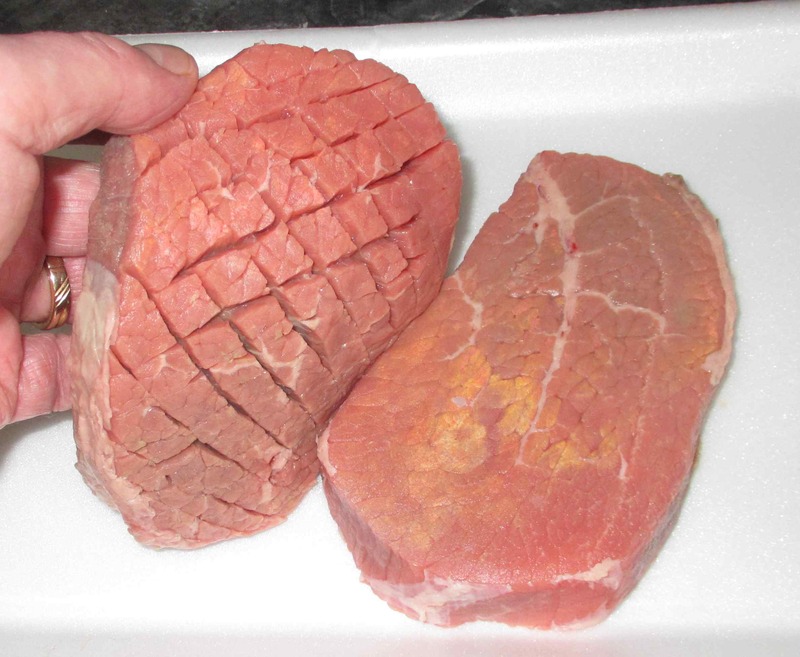 Next, use a meat mallet and pound the steaks well, making sure to work the flour mixture into the flesh as it gets tenderized. Pour the beaten egg into a shallow pan and dip the steaks into it, turning to coat both sides. Now, dredge the steaks in the flour, pressing well to form the first coat. Repeat these steps again and, if you have sufficient egg leftover, do it a third time. Set the steaks aside on a sheet of waxed paper for the time being. When you are ready to cook, heat a generous amount of shortening or other cooking fat in a frying pan (adding a little bacon fat as well, if you like) and brown the steaks nicely on each side. Use a moderate flame and allow coating to get just a bit crispy at about the point same that the meat is cooked through. Finally, remove to a paper-towel lined platter to remove excess oil and then serve when ready. By the way, you will notice here that I am frying one steak at a time in a small pan rather than both together in a larger one. This is so that I can get sufficient depth of cooking fat while using a minimal amount. am with you on being mystified. Steak fried like chicken? Fish are fried, too, so why not fish-fried steak? Good point about it being a good use for cheaper cuts of beef. You are an adventuresome cook 😉 That’s one dish I haven’t dared try as I’m not from the south and I just don’t quite get it. I often crave foods that I’ve never tried before, simply after reading about it online. I’ve heard of a chicken fried steak but never tried one. I have to admit, I assumed it was a piece of chicken rather than beef. 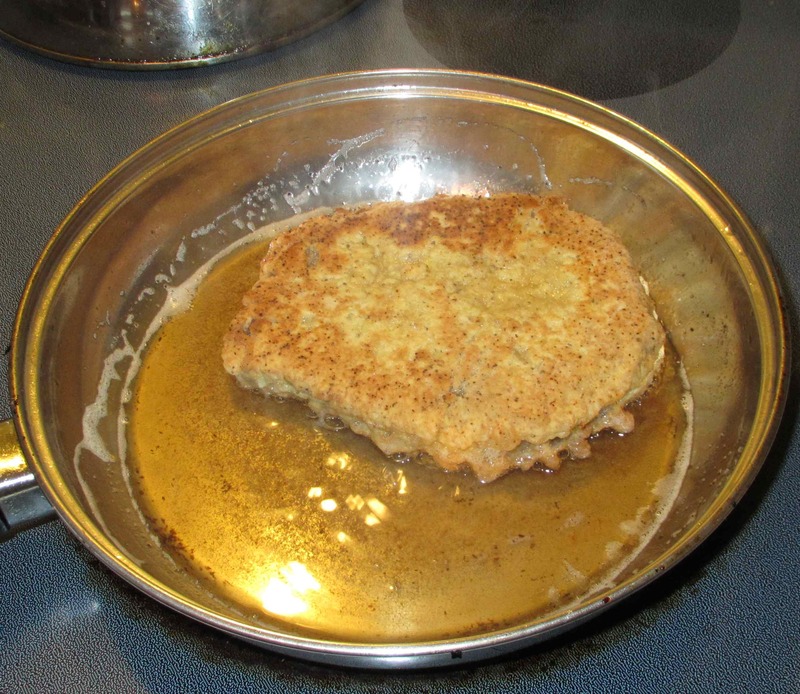 Breading and deep-frying seems like a lot of extra work for a simple pan fried steak. Was it worth it? I do love gravy though so that’s where I would differ. I often contemplate eating gravy like you would a bowl of soup. p.s. this would make a great addition to Our Growing Edge this month. Having lived in the South for much of my life, this is one of those foods that I take for granted, although it’s also one of the foods that I only ever ate at restaurants. We never made it at home. For me, the gravy really makes the dish. It should me a milk-based gravy with lots of ground pepper. It adds a nice bit of seasoning and moisture to what can be a dense piece of meat. I’ll be back in the US for a few weeks in September and I’m sure I’ll order this while I’m there. I can see where it must be a comfort food for those growing up with it! Yes. Lots of ground pepper in the milk-based gravy is the ticket. Crumbed and fried is always delicious. Crumbed probably looks the prettiest too. The gravy in the deep south is called saw-mill gravy. Here in Virginia it is usually referred to as sausage gravy. Personally the flavor depends on who cooks it. Usually ig is bland like flour paste with chucks odd old sausage in it. Though I have had some amazjng saw-mill gravies in the south; although I am sure they were filled with the sausage grease and were very fresh. I did read about gravy with sausage in it, but I have never come across the name ‘saw-mill’ gravy before. Having grown up in Texas, where chicken fried steak can be found in most restaurants, I have a suggestion. To have a tender meat and a terrific crust, it should be marinated in buttermilk first. I’ve done that with fried chicken before… it does tenderize! My first experience was in Fredrick when visiting Fort Detrick in MD. I agree, the steak was fine, the gravy not so much. I liked the mashed potato and the crumbed and fried ochre. A different gravy might be better. I wasn’t crazy about the ‘white sauce’ kind. 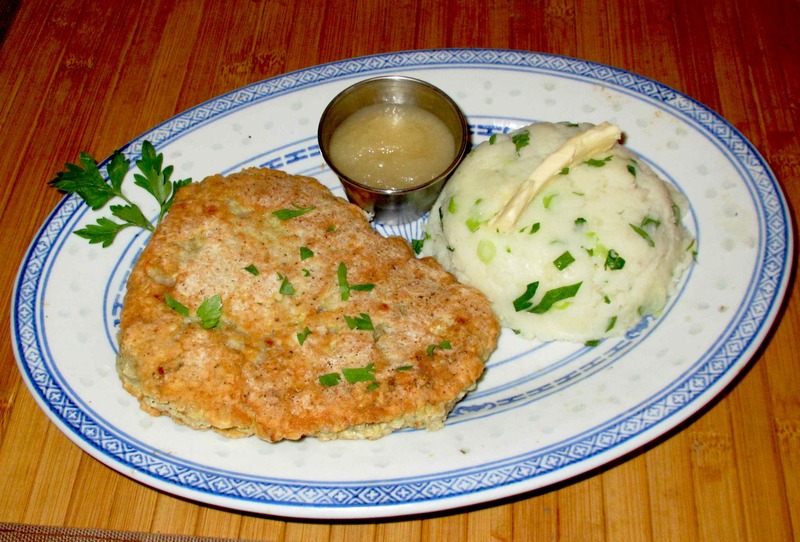 I actually ran into the term “chicken-fried” steak just a short while ago and was just as mystified! Thanks for the great post! Do you remember where in Virginia the restaurant was? I wouldn’t mind visiting that place someday. Oh… not a clue I am afraid. It was a highway restaurant on the I-95 as far as I can recall but even the name is long since gone from my memory. Chicken fried steak is really common all throughout the south, though, so you should have no problem finding it anywhere. Although I’ve grown up in the South, I’ve never had chicken-fried steak yet. I really have to try it sometime. Most places will have it. Check trip adviser for assistance on finding a good local southern restaurant. Local hot spots will almost always have the best. Saw-mill gravy on homemade biscuits can be divine. Nice! I’m a vegetarian but I’ll make sure my parents try this. Haha I trust your word, fellow lawyer friend. Ah! My guilty pleasure meal whenever I visit back home! Yum. Yours looks delicious!